Pedaling the road: OK to quit mid-giro? "Yes, I'm going home this evening. The last week has no sprints. I'm a pro, I need to recover for the Tour de France." 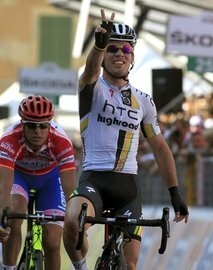 Many reacted to Cav's statement, some amused while others believe it is sad that riders only do the stages they want or stages they have a decent chance of winning. One perspective is that the Giro is indeed a stage race, indicating that going only for a few stage wins is not good for the sport. Some stated on twitter that they would leave their job half-time tomorrow, if the workload proved to be too much. From the organiser's point of view, they want the big shots coming. To have Cav, Petacchi, Contador, Nibali et al present, draw audience and TV coverage to the race, translated to income for the race organisers. The Giro celebrates the climbing goats, the last week, as Cav's mentioning, are not flat. A part of every Grand Tour is to have a variety of stages. Not only to give riders the time to recuperate properly before the hard mountain-top finishes, but also to attract world class sprinters. A variety in terrain is also good the regions the race is passing through, for tourist purposes. And I don't believe any was surprised by Cav leaving, it was scheduled long time ago. This doesn't make it right to those who believe it is wrong, I know that. To me, watching Cav and other sprinters struggle up extreme mountains over three weeks is not much fun. It doesn't even make me feel better as a cyclist either, because Cav vs me up the Gavia would make me loose ten out of ten times. The last week is all about the GC riders anyway. Who cares if Cav finish 87th or 176th place in the Giro? Still, it his job as Cav is saying in this video. Is he doing his by quitting? Those riders going all out on the climbs or the riders not ment to climb like mountain goats, will have trouble recuperating in time for the Tour. And that is Cav's primary target this year. I have heard many say that cycling is a metaphor for life, sometimes it is hard and uphill, sometimes easy and downhill. Suffering, never give up. The words people associate cycling with are many, this is what makes it difficult to accept Cav et al quitting the Giro. Perhaps is this a sign that the Giro is too hard? Perhaps does this mean that teams should play a bigger role than before and that team effort should be rewarded more somehow. More money to teams who finish the race as many riders as they were at the beginning? Still, both HTC and Lampre have riders capable of finishing the Giro within GC top seven. If they didn't, I would be worried for the sport too.